Mitch Botfield (right) bagged the winner for impressive Church on Saturday. Picture by Steve Evans. ALVECHURCH boss Ian Long stressed victory over play-off rivals Coalville Town will be more important than toppling champions-elect Kettering Town. Long described the 2-1 win at the Poppies – denying the leaders winning the title in front of 1,500 fans – as one of the best battling performances of the season. 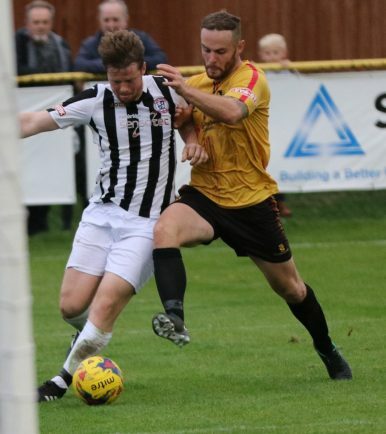 It pushed Church into fourth place in the Southern Premier Central table but the boss says the same fighting spirit will be needed against sixth-placed Coalville in Saturday’s clash at Lye Meadow. They still need six points from their final four matches in their first season at step three to seal a play-off place in their push for a third successive promotion. Lying two points behind third-placed King’s Lynn Town, Long has challenged the Church to grab a top-three place to secure home advantage in the play-offs. 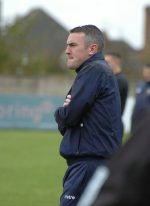 “Last Saturday’s game at Kettering wasn’t as important as Saturday’s game against Coalville,” said Long. “If we lose Coalville will be right on our tails. If we beat them, they can’t catch us. It’s a massive game for us. “I think we surprised Kettering and it was nice to hear the Kettering fans being complimentary about us afterwards. They will win the league, I’m certain, but we are chasing our own dreams. “Over the three seasons we’ve (management team) been at Alvechurch, we’ve not finished outside the top three and that’s a record we’d love to continue. It’s a huge ask but every time I challenge these players they respond. “The players have been remarkable all season. I can’t praise the players enough. “It was a fantastic all-round team performance against Kettering. Aaron Lloyd was superb, Dave Bellis was fantastic in midfield and the two centre-backs were dominant but every single player could be proud of their performance. Alvechurch had stunned the Poppies fans by taking the lead inside three minutes as skipper Jamie Willets sent a thundering header from a Tom Turton corner into the net. Church keeper Dan Crane kept out Poppies’ efforts to level but he was beaten on 53 minutes when Craig Stanley finished from close range, but Alvechurch sub Mitch Botfield bagged the winner on 88 minutes from Andre Landell’s cross, with the ball slipping through the hands of keeper Paul White. Alvechurch are set for a double boost for the clash with Coalville, who won 2-0 when the sides met in August, with both defender Josh Ezewele and midfielder Lee Chilton both back training. It had been feared both would struggle to play again this season but they trained on Tuesday and will be assessed before kick-off. Ezewele (hamstring) had been hurt in the win against Leiston, while Chilton has been struggling with a groin problem for the past couple of months.